The PHP-200B series has been discontinued. Please see the PHP300/400/500 Series as a possible alternative or contact our Flow Engineering department. The PHP-200B Series is a diaphragm-type, solenoid driven microprocessor based metering pump with maximum capacities to 4.5 gph and maximum back pressures to 253 psig. The housing is constructed of fiberglass-reinforced PPE plastic, with a NEMA 4X (IP65) enclosure rating to protect against corrosion, dust and water. A removable hood covers the faceplate. The drive unit houses a short-stroke solenoid with a maximum stroke length of 1.25 mm (0.05"). It is equipped with a noise suppressing mechanism for quiet operation and has only one moving part, the armature. The diaphragm is constructed of fabric-reinforced EPDM elastomer with a plastic core and PTFE facing. It is chemically resistant against virtually all process fluids and can be used over a wide temperature range. Suction and discharge ports are equipped with double ball check valves for maximum repeatability. Feed rate is determined by stroke length and stroke rate. Stroke length is manually adjustable from 1 to 100% in increments of 1% via the stroke length knob. 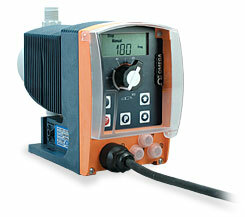 Two control modes are available for the PHP-200B Series: manual or analog control. The PHP-210B Series incorporates all the features of the PHP-200B and also accepts a current input signal. This allows the stroking rate to be controlled by standard process signals. 참고: Each unit is supplied with foot and injection valves, 1.8 m (6') of contact cable for pulse input, and level connector. Polypropylene models are supplied with a 3 m (10') or 1.5 m (5') length polyethylene tubing. † Capacities and suction lifts are for water-like fluids. Higher specific gravity fluids reduce suction lift, while higher viscosity fluids reduce capacity. * “-S” pumps have 1/4" FNPT connections.